Using the CastorMarshaller class, we can marshal the java objects into xml and vice-versa using castor. It required the mapping File. Step1. 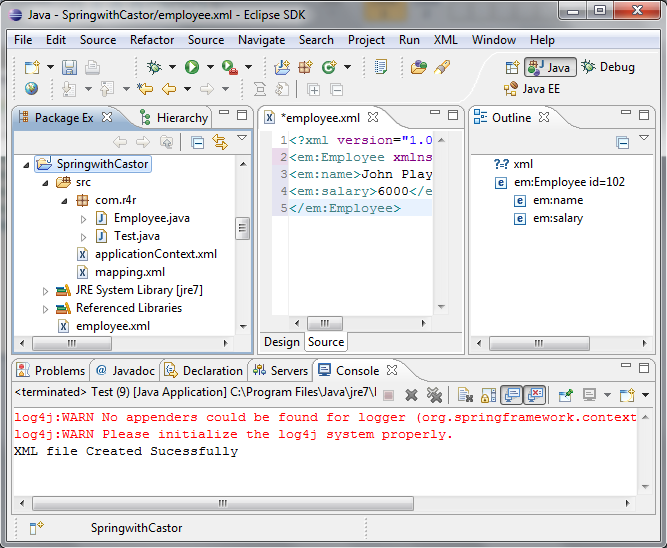 Now you create a simple Java Project using Eclipse IDE. Follow the option File -> New -> Project and finally select Java Project wizard from the wizard list. Now name your project as SpringwithCastor using the wizard window as given below. Step2. 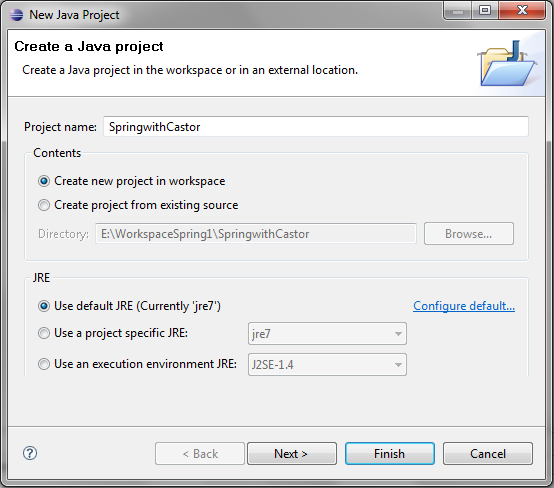 Now add spring jar in your project, To do this, right click on your project name SpringwithCastor and then follow the following option available in context menu: Build Path -> Configure Build Path to display the Java Build Path window as given below. There are some jar files required to run this application, To load the jar files in eclipse IDE, Right click on your project - Build Path - Add external archives - select all the required jar files - finish. Step4. Now create the xml file click on src- new -file -give the file name like applicationContext.xml then finish. Step5. Now create another xml (Mapping File) file click on src- new -file -give the file name like mapping.xml then finish. <!DOCTYPE mapping PUBLIC "-//EXOLAB/Castor Mapping DTD Version 1.0//EN"
Step6. Now Create the java Main class (Test.java). And this is the XML File that is created by the above Program.